UnigineEditor provides a useful tool for painting image masks directly in the scene - Mask Editor. It allows editing the existing image masks and creating new ones. The chapter on Masking Areas with Objects for Mesh Clutters and World Clutters. Add ObjectGrass, ObjectMeshClutter or WorldClutter to the scene by choosing the required object via the Menu bar (the Create menu item). Specify all the required settings for the added object. Choose Windows -> Toggle World Hierarchy to open the World Hierarchy window. In the World Hierarchy window, select an ObjectGrass, ObjectMeshClutter or WorldClutter node. In the Parameters window open the Grass, MeshClutter, or Clutter tab correspondingly. Here, click next to the Mask Image field. Specify the size and the format of the mask in the window that opens and click OK. 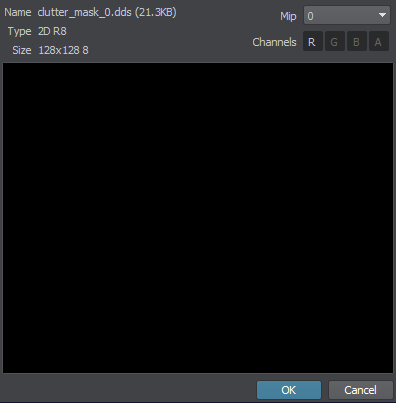 In the file dialog window that opens, specify the mask name, choose the folder within your project to save the mask and click OK. An empty image mask will be created. Perform Steps 4-7 described below to paint the mask. The Mask Editor will open. Specify the required brush settings. Hold Alt + Left Mouse Button to paint the mask in the scene. 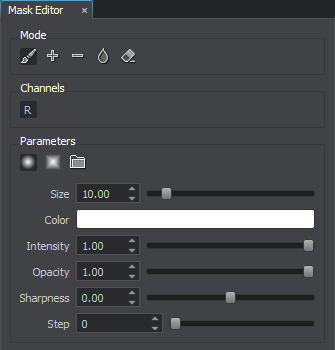 Replace - replace pixel values of the image mask with the current values set for the brush. Add - add pixels to the image mask (in other words, add areas to the image mask where grass or clutter objects should be placed). Subtract - subtract the current values set for the brush from pixel values of the image mask. Smooth - blur pixels of the image mask, making boundaries softer. Erase - erase pixels of the image mask. custom brush. The texture is loaded using the additional button . The rate to apply the brush. Tip of the brush. The lower the value, the sharper and smaller the tip. The higher the value, the flatter and bigger the tip. The distance between the brush marks in a stroke, in pixels.